When long range hunters, shooters, or precision rifle competitors need extreme accuracy, Leopold's VX-3i LRP (Long Range Precision) delivers. The Twilight Max light management system lets you hunt longer, or pick out distant targets from the shadows with unsurpassed clarity and resolution. When long range hunters, shooters, or precision rifle competitors need extreme accuracy, Leopold &apos;s VX-3i LRP (Long Range Precision) delivers. The Twilight Max light management system lets you hunt longer, or pick out distant targets from the shadows with unsurpassed clarity and resolution. Choose first or second focal plane reticles in MOA or MIL, with matching adjustment increments to match your specific shooting style. The all new elevation adjustment features a unique travel indicator marked in 5 mil or 5 moa increments, and is easy to read from the prone or difficult shooting positions. An adjustable zero stop prevents over rotation. The windage dial features a protective cover that can be replaced with the included thread protector if you prefer running an exposed dial. A redesigned power selector with included throw lever makes magnification changes quick and easy. The VX-3i LRP defines Versatility. Features 1/4-MOA target-style click windage and elevation adjustments. While Leupold still waterproofs other optics with bone-dry nitrogen, technology pioneered by Leupold®, select models feature their exclusive, proprietary Argon/Krypton gas blend. Its advantages are two fold: it nearly eliminates the effects of thermal shock, and the Argon/Krypton molecules are significantly larger than nitrogen molecules, reducing the diffusion of gases sealed inside your scope even more than our proven nitrogen technology already does. They pioneered riflescope waterproofing, and now with Argon/Krypton they&apos;re exceeding the standards they set for themselves. Outstanding accuracy, legendary ruggedness, and absolute waterproof integrity. All Leupold® optics offer performance that makes them equally at home in hunting or tactical environments. Leupold Long Range/Tactical riflescopes are excellent choices for both long-range hunting and varminting. 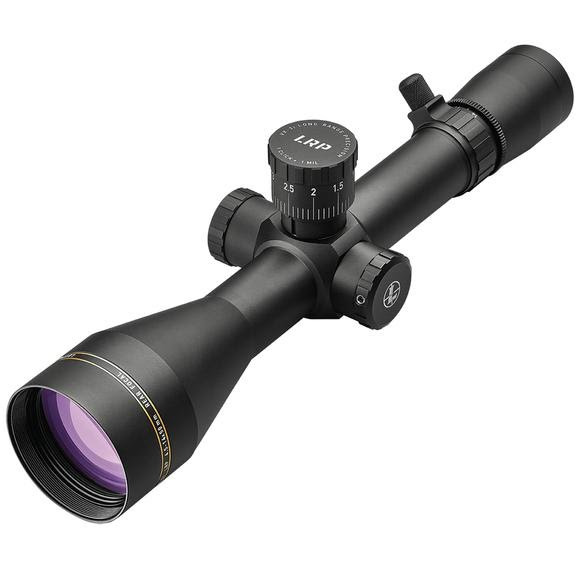 Likewise long-range competitive shooters and members of the Fifty Caliber Shooters Association, men and women who shoot competitively at ranges of 600 yards or more, rely on the accuracy and durability of these scopes.